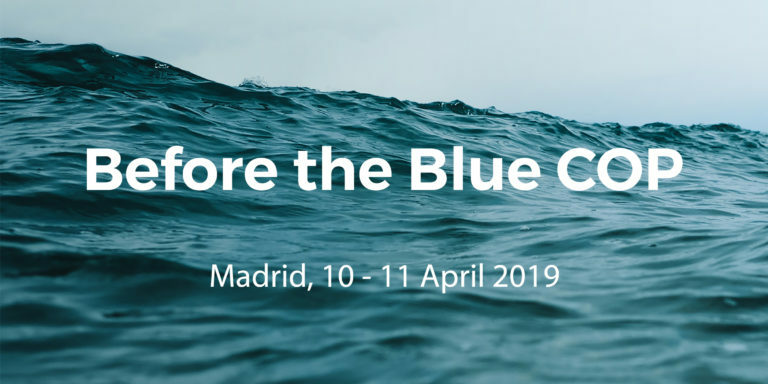 The Technical Workshop “Before the Blue COP” will meet from 10-11 April 2019 at Fundación Biodiversidad, in Madrid, Spain. This meeting is part of a series of workshops to strengthen the links between climate policies and ocean protection. Integrating ocean conservation measures into countries’ climate actions has a potential to provide significant benefits for the health of both the climate and the ocean. The meeting brings together climate and ocean experts to discuss actions to mitigate climate change, improve the resilience of coastal communities, increase the conservation of marine ecosystems and ensure adaptation to face climate change impacts. Themes that the workshop sessions will discuss include: the state of knowledge concerning climate and ocean change; the ocean in UNFCCC climate actions; synergies and gaps in climate and ocean actions; and national perspectives. The workshop is convened by the Because the Ocean Initiative. The Initiative was launched in 2015 during the 21st UNFCCC Conference of the Parties (COP) in Paris. The second “Because the Ocean” declaration, signed in 2016 by 38 countries, encourages UNFCCC parties to consider submitting Nationally Determined Contributions (NDCs) that contribute to the protection and conservation of the ocean. The Madrid workshop will aim at providing recommendations and options for governments in incorporating ocean-related measures.